T-Mobile has the T-Mobile Rocket 4G Laptop Internet Access on sale for only $19.99 with Free Shipping and a FREE $15 prepaid data refill card. This offer is for a limited time only. 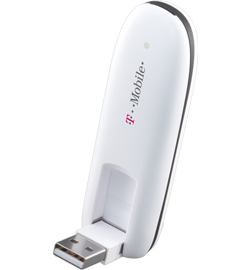 Just plug the Rocket 4G Laptop Stick into your laptop and get high-speed Internet anywhere with convenient access through T-Mobile’s 4G mobile network. Flexible prepaid pricing for data ranging from 100 MB for a week to 3 GB for a month. The Rocket 4G offers plug-and-play access and it's compatible with laptops running Microsoft Windows (7, Vista, or XP) and Mac OS X (10.4 or higher). One important thing to note is that you need to ensure that T-Mobile has coverage for the areas in which you will travel. Once you receive the unit, try it out quickly so you can return if it doesn't work out.